On 3 June 2015 Peter Thomas gave a talk at the Group of 17 hosted by Dan O’Neill’ called “Cracks in the Fortress? Project Europe and Prospects for the Left”. Here are some afterthoughts by John Ransley that may be of interest to the people who attended or like me missed the talk. 1. Forget about the debt number and focus on the primary surplus. 2. 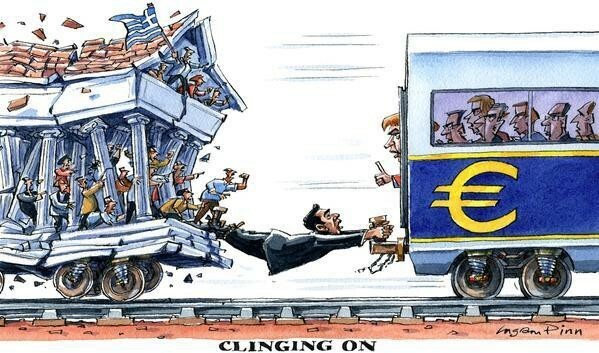 What do the troika want? They want to increase the Greek primary surplus to 4.5 percent by imposing even more severe austerity, and take this surplus to pay off debt or at least interest on debt. For this they are offering €7.2bn in fresh financial help, which would mostly be used to maintain the round robin of scheduled debt repayments to creditors. Their big stick is forcing Greece out of the eurozone, which they know would be deeply unpopular with Greek voters, besides causing massive economic damage. According to Paul Krugman, the effect of their demands if accepted would cut Greek GDP by 8 percent. Peña – popular music combined with socialising and food.